The Lion of England from the Royal Arms is believed to have been granted to the regiment by William III and confirmed by the Royal Warrant of 1 July 1751. The 4th or The King's Own Regiment traces its origins to the 2nd Tangier Regiment of Foot. This was raised in Devonshire in 1680, by Charles, Earl of Plymouth, son of Charles II, to defend Tangier which had been ceded to Charles II on his marriage to Catherine of Braganza, Infanta of Portugal. The 4th Foot consisted of sixteen companies and a Grenadier Company formed on 19 July 1680 by selecting 8 men from each of the 16 companies. The fort was blown up as it was impossible to defend it against repeated attacks by the Moors, and the 2nd Tangier Regiment returned to England in 1684. The 4th Foot was the first regiment to join William of Orange on his landing at Torbay on 4 November 1688. The king granted the regiment the title the King's Own and directed to be borne on its Colours The Lion of England as the badge of the regiment. On 1 July 1690, the 4th was at the battle of the Boyne. In 1684 the 2nd Tangier Regiment was The Duchess of York and Albany's and when the Duchess became Queen Consort the following year this was altered to The Queen's. When George I came to the throne another alteration took place to The King's Own. From 1704 to 1710 it served as a Marine Corps on board the fleet and was present at the capture of Gibraltar (1704–05). In the beginning of the reign of Queen Anne, six regiments of marines were raised. Consequently, in 1711, the 4th reverted to a Foot Regiment. On 25 June 1827, royal approval was granted for the 4th to bear on its Colours the word Bladensburg, in commemoration of its distinguished conduct on the heights above Bladensburg on 24 August 1814. Between 1867 and 1881, the regimental title was The 4th (The King's Own Royal) Regiment. In 1881, it became Lancaster's County Regiment and adopted the Red Rose of Lancaster as one of its badges. On 1 July 1881 the 1st Battalion 4th (The King's Own Royal) Regiment became the 1st Battalion The King's Own (Royal Lancaster Regiment). In 1920 the regimental title changed to the King's Own Royal Regiment (Lancaster). On 1 October 1959 the King's Own Royal Regiment (Lancaster) amalgamated with the Border Regiment, to form the King's Own Royal Border Regiment. 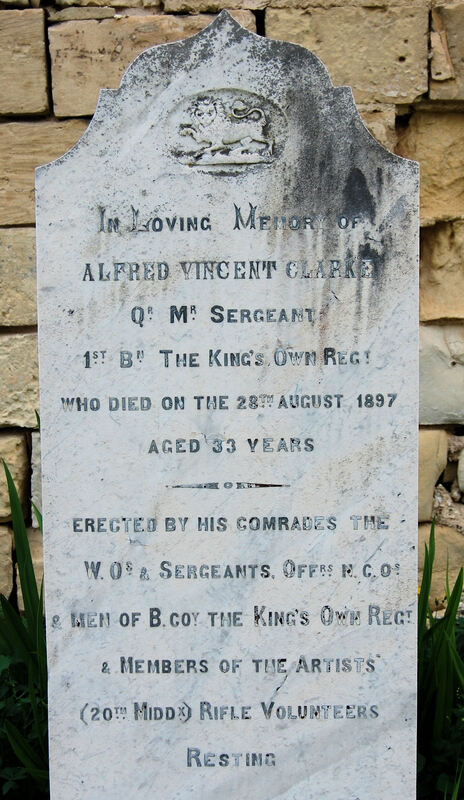 The King's Own Royal Regiment (Lancaster) bears the Battle Honour Malta 1941 – 42. 25 Mar 1854 The 1st/4th Regiment arrived from Scotland with 814 men fit for duty. It encamped on the Horn Works outside Porte de Bombes. 10 Apr The battalion left for Turkey on board the Emue for service in the Crimea. 5 Apr Pte James Billows aged 37 years. 13 Apr Pte Joseph Jones aged 19 years. 1 Jan Pte John Harvey 4th Regiment. 4 July Pte George McCartney 4th Regiment. The 1st/4th The King's Own Regiment arrived at Barbados from Gibraltar in January 1879. In November 1881, it returned to England from the West Indies having been ordered home on account of the prevalence of yellow fever at that station, and in consequence of the officers and men of the corps having suffered very severely from the disease. 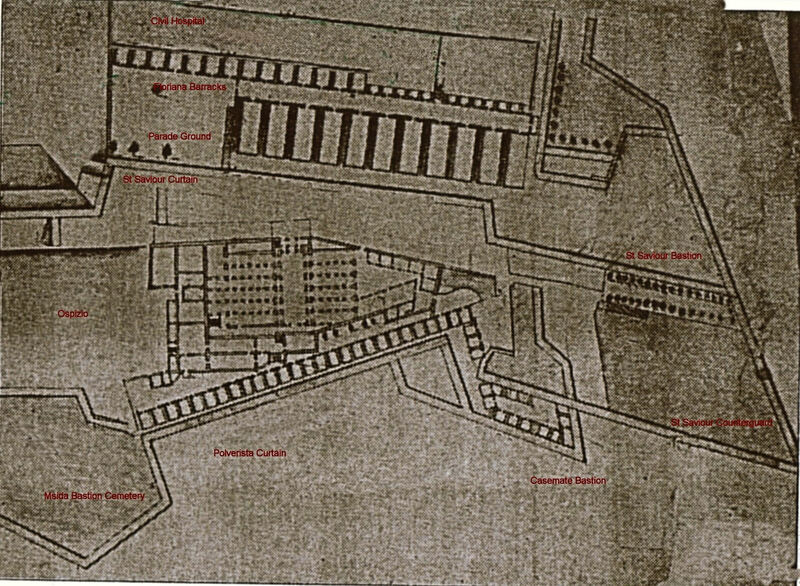 Plan of Mtarfa Barracks 1911 (TNA:T 161/874). 24 Sep 1895 The 1st/Royal Lancaster Regiment left Bowerham Barracks, Lancaster. It embarked at Portsmouth and disembarked in Malta on 4 Oct 1895. It had an average strength of 126 men with 152 admissions (1206.30/1000 mean strength) into hospital and 1 death (7.94/1000 mean strength). Its average constantly sick was 8.37 (66.43/1000 mean strength). The average sick time to each soldier was 24.25 days. The average duration of cases of sickness was 20.10 days. 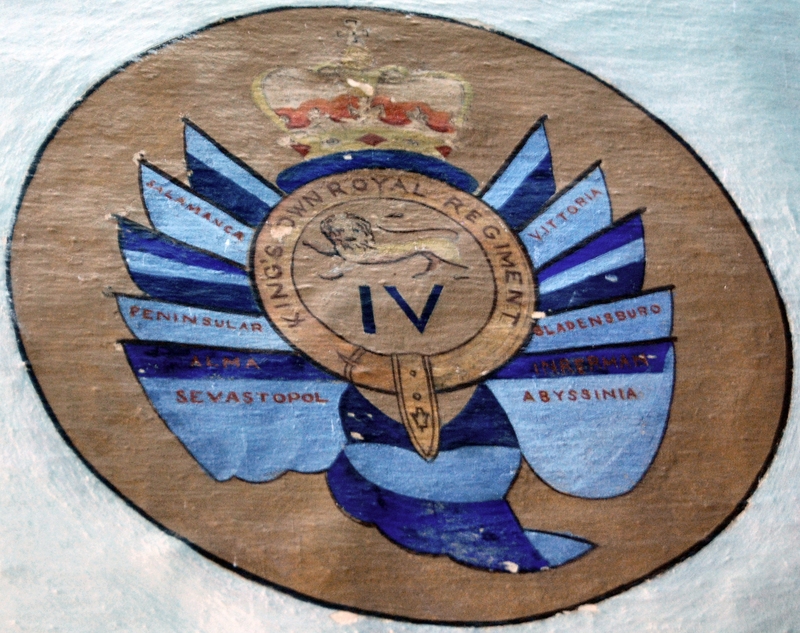 The 1st/Royal Lancaster Regiment was quartered at Pembroke Camp for 3 months. 7 Oct 1895 Burial of Amelia Selliott, aged 8 months in Pietà Military Cemetery. 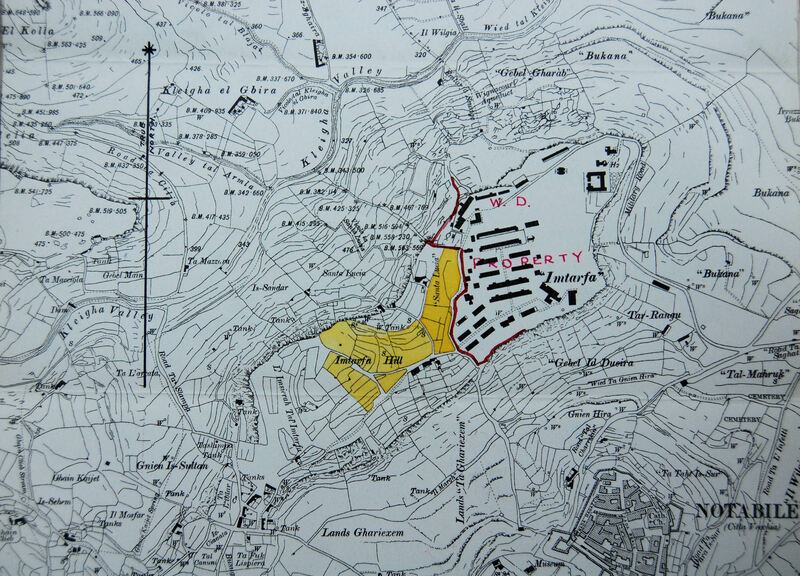 22 Dec Baptism of Mabel Selliott born 18 Dec 1895, daughter of Mary and Sgt William Benjamin of Floriana. 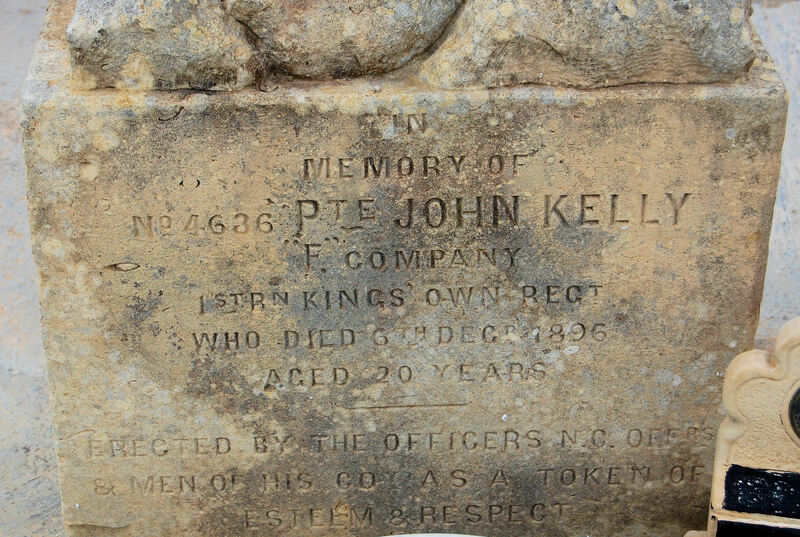 4636 Pte John Kelly F Coy 1st Roy King's Own Regt died 6 Dec 1896 aged 20 yrs. The 1st/Royal Lancaster Regiment had an average strength of 872 men. It had 760 admissions (871.6/1000 mean strength) into hospital with 10 deaths (11.47/1000 mean strength). 20 invalids returned to England. Its average constantly sick was 51.09 (58.59/1000 mean strength). The average sick time to each soldier was 24.44 days. The average duration of cases of sickness was 24.60 days. The 1st/Royal Lancaster Regiment was quartered at Mtarfa Barracks for 12 months. It was the first regiment to occupy the newly constructed barracks. In July 1896, there were nine cases of enteric fever with five deaths at Mtarfa Barracks (Imtarfa). The regiment also had 116 cases of malarial fevers in a large draft which had arrived from India in February. There were no deaths. 11 Aug Pte Walter Crane aged 23 years, died at Cottonera. 17 Aug James Smith aged 20 years 9 months, died at Cottonera. 11 Nov Arthur Brown aged 24 years, died at Cottonera. 6 Feb Pte David Metcalf aged 22 years 11 months. 23 May George Bindley aged 22 years. 29 June Infant Richard Ornerod Bradshaw aged 6 months. 10 July Pte Launcelot Lancaster Parker aged 20 years 10 months. 11 July Pte Frederick Beckett aged 21 years. 1 Aug Pte Robert Thompson aged 24 years. 16 Aug Infant Marguerite Heap aged 6 months, daughter of Sgt John Heap from Mtarfa. 14 Sep Infant Nellie Rogers aged 7 months, daughter of CSgt C Rogers. The 1st/Royal Lancaster Regiment had an average strength of 858 men. It had 714 admissions (832.2/1000 mean strength) into hospital with 6 deaths (6.90/1000 mean strength). 32 invalids returned to England. Its average constantly sick was 50.34 (58.67/1000 mean strength). The average sick time to each soldier was 21.42 days. The average duration of cases of sickness was 25.73 days. The 1st/Royal Lancaster Regiment was quartered at Mtarfa Barracks for 3 1/2 months and Lower St Elmo Barracks for 7 months. It embarked for Hong Kong on 25 Nov 1897, where it arrived on 26 December. 24 June Pte John Jones aged 23 years, died at Fort St Angelo. 21 Oct Walter Lawrence Reeves aged 4 months, son of Sgt Fort St Salvatore. 31 Oct Infant Arthur Jones aged 4 days, son of CSgt Jones. 16 Dec Pte Charles Triminer aged 22 years 2 months. 25 Nov 1897 The 1st/Royal Lancaster Regiment embarked for Hong Kong, leaving 12 men in Malta with 8 in hospital. It arrived in Hong Kong on 26 December 1897. 19 Nov 1901 The 1st Battalion Royal Lancaster Regiment arrived in Aldershot on 26 March 1900. It embarked at Southampton on the Sicilia and disembarked at Malta on 28 Nov 1901. 21 Jan Pte Henry Gilling aged 19 years, died at Cottonera Hospital. 29 June Arthur William Shearer aged 10 months, died at Cottonera. 7 July Joseph Henry Hutchinson aged 1 month, died at Cottonera. 27 July Pte Charles Stirland aged 29 years, died at Cottonera. 28 Dec Alice Fitton aged 3 months, daughter of Sgt Fitton died at Cottonera. 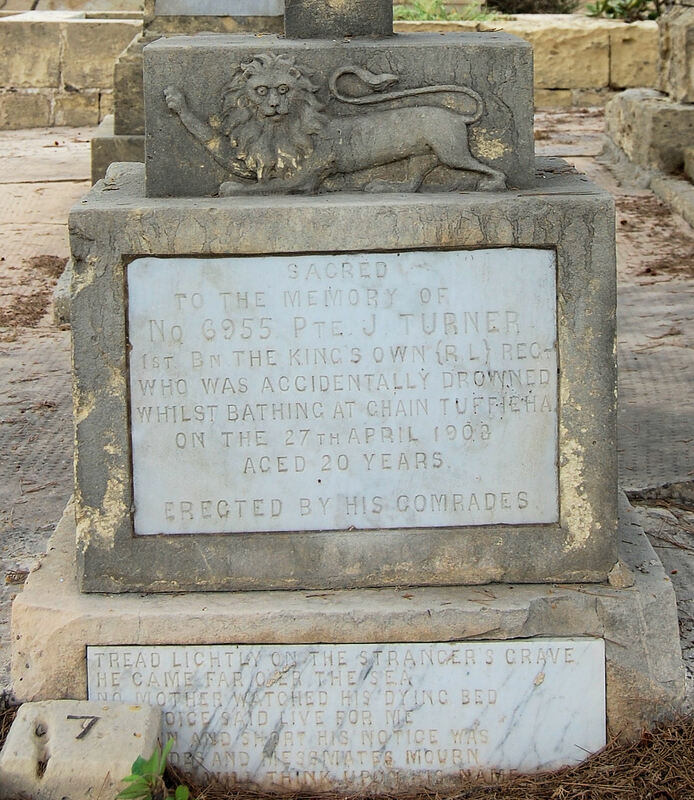 6955 Pte John Turner accidentally drowned whilst bathing at Ghajn Tuffieha 27 Apr 1903. 29 Apr 1903 Burial of Pte John Turner aged 19 yrs at Mtarfa Military Cemetery. 17 Sep 1903 The 1st Battalion embarked on the Soudan for Bombay, where it arrived on 2 Oct 1903. 8 Jan John Chadwick Fitton aged 1 year 5 months, son of Sgt Fitton died at Cottonera. 24 Apr Francis Payne aged 24 years, died at Cottonera. 30 May W Cole aged 5 months, died at Zabbar. 19 July Pte Thomas C Hemus aged 32 years, died at Cottonera. 21 Aug L/Sgt William Thomas aged 24 years, died at Cottonera. 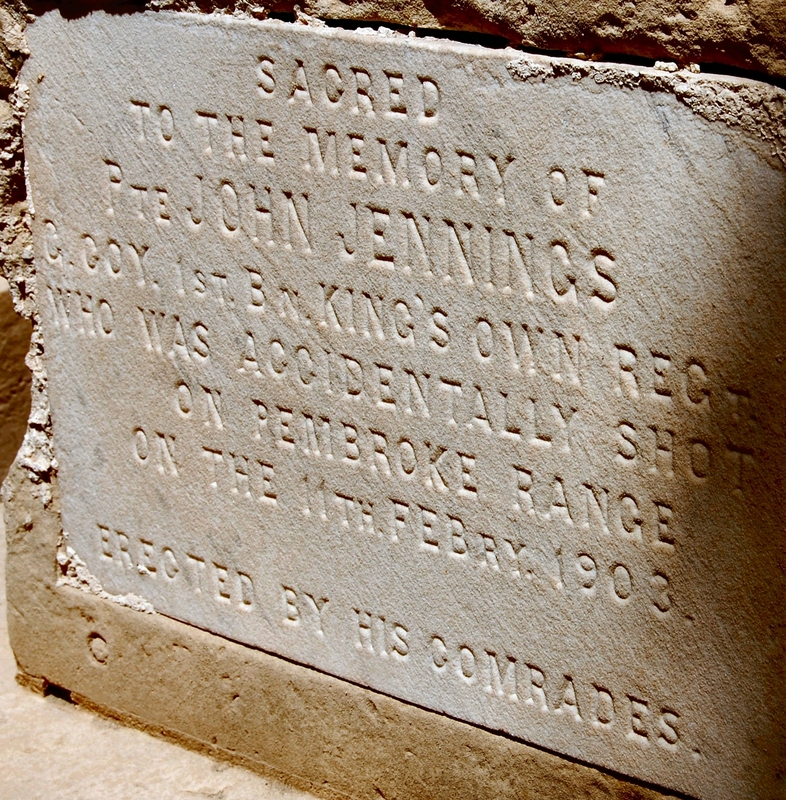 13 Feb Pte John Jennings, aged 21 years 9 months, was accidentally shot on Pembroke Ranges on 11 Feb 1903. 4 June 1864 The 2nd Battalion The King's Own Regiment arrived from Corfu where it had served since 2 June 1859. In 1864, the regiment had an average strength of 450 men, 365 hospital admissions (811 admissions per 1000 of mean strength) with 3 deaths in hospital and 3 out of hospital (13.33 deaths per 1000 of mean strength). In 1865, the regiment had an average strength of 743 men. There were 587 hospital admissions (790 admissions per 1000 of mean strength) with 21 deaths in hospital, 1 out of hospital and 1 death among the invalids (32.30 deaths per 1000 of mean strength). The 2nd/4th Regiment occupied Floriana Barracks; their families were in old badly constructed and dilapidated huts on the Hornwork of Floriana, which they shared with the families of the 100th Regiment. Floriana Barracks had been an old casemated store house, which had been adapted to accommodate the infantry. It was bounded on one side by a parapet which overlooked on to the Ospizio dei Vecchi and St Salvatore Counter Guard. On the other side was the Civil Hospital. On 13 July an officer's servant and the wife of a private soldier fell ill with cholera. Panic ensued in the barracks which lasted for two days and two nights, when men and women became very agitated and convinced themselves that they had caught the disease. The men were transferred from their barracks and placed under canvas on the Floriana parade ground, three companies moved into huts on Notre Dame Ravelin. A hospital marquee was erected as it was too far to admit patients to the General Hospital in Lower Merchant Street Valletta. Infected bedding was destroyed and the excreta disinfected and buried in pits. Despite these precautions more cases followed. Surgeon Benjamin Lane urged the removal of the troops to St George's Bay or Citta Vecchia, but the PMO, Inspector General Arthur Anderson placed them under canvas upon the adjoining parade ground. The men persisted in using the barracks by day but slept under canvas at night. From 13 to 20 July, cholera raged among the families. Surgeon Lane suggested all the families to be moved under tents upon the same ground as that occupied by the men. In July there was a total of 21 sick with 15 deaths. In August 9 fell ill with 7 deaths. The last soldier died on 16 September. The 2nd/4th had a total of 31 sick and 23 deaths. 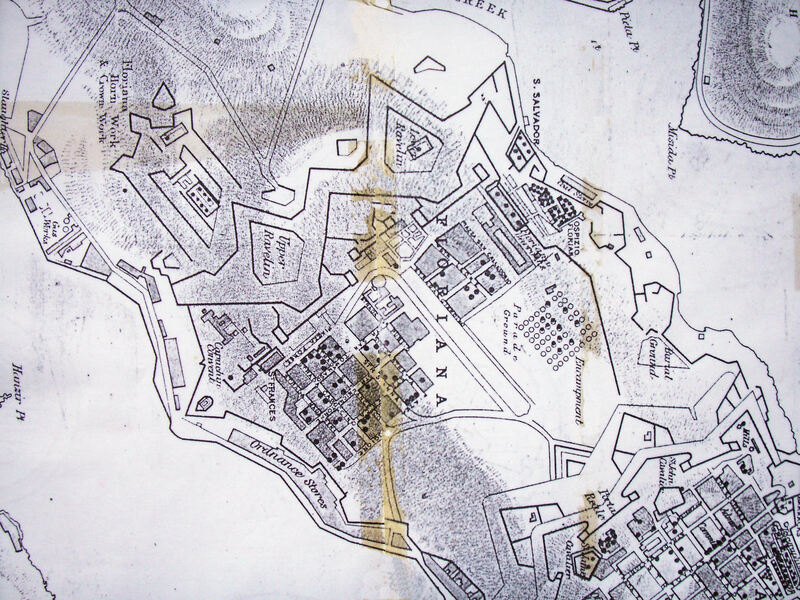 Deaths from cholera occurred at Floriana Barracks (5), Floriana Pavilion (1), Notre Dame Ravelin (4), Horn Works (3), Valletta Hospital (2), and Floriana Encampment (8). William Brooks 2nd/4th KORR died of cholera 16 Sept 1865 aged 26 years. (Quarantine Bastion Cemetery Floriana). In 1866, the regiment had an average strength of 157 men. There were 68 hospital admissions (433.1 admissions per 1000 of mean strength) with 1 death in hospital (6.37 deaths per 1000 of mean strength). 27 Mar 1866 The 2nd Battalion embarked for Nova Scotia where it arrived on 21 April 1866. It was relieved in Malta by the 1st/8th Regiment. 2 Aug 1941 The 8th Battalion arrived at Malta. It had 33 officers and 810 men. 10 Oct 1943 The 8th Battalion left for Palestine. On 30 Jan 1944, it absorbed 58 survivors of the 1st Battalion. This had moved to Leros from Palestine in 1943 and was virtually annihilated in the German assault on the island. Record of the services of British Regiments. The Fourth (The King's Own) Regiment of Foot. The Naval and Military Magazine Vol IV No VIII page 317, December 1828. London 1828. Boileau, J. P. H., A few remarks on yellow fever and on the movement of troops . Br Med J (1882), page 7, (Published 7 January 1882).